Dr. A. Parasuraman is a Professor and Holder of the James W. McLamore Chair in Marketing at the University of Miami. He obtained his B.Tech degree in Mechanical Engineering from IIT Madras in 1970, MBA degree from IIM Ahmedabad in 1972 and Doctor of Business Administration degree from Indiana University in 1975. Dr. Parasuraman teaches and does research in the areas of service marketing, service quality measurement and improvement, and the role of technology in marketing to and serving customers. In 1988 he was selected as one of the “Ten Most Influential Figures in Quality” by the editorial board of The Quality Review. He received many distinguished teaching and research awards, including the Best Professor Award given by the Executive MBA Classes in 1996, 1998 and 2000, and the Provost’s Award for Scholarly Research in 1998. He also received the American Marketing Association’s “Career Contributions to the Services Discipline Award” in 1998 and the Academy of Marketing Science’s “Outstanding Marketing Educator Award” in 2001. Dr. Parasuraman has written numerous articles in leading journals such as the Journal of Marketing, Journal of Marketing Research, Journal of Retailing, and Sloan Management Review. He has served as editor of Journal of the Academy of Marketing Science (1997-2000) and is the editor for Journal of Service Research (2005-2008). He also serves on the editorial review boards of ten journals. He is the author of four books. He is an active consultant and has conducted dozens of executive seminars on service quality, customer satisfaction and the role of technology in service delivery in many countries. In recognition of his outstanding contributions to the field of Management, IIT Madras and its alumni are proud to confer on him this award. Dr. Jayakrishnan is the Head of Polymer Chemistry Division at Sree Chitra Tirunal Institute for Medical Sciences and Technology, Trivandrum. He is an internationally renowned scientist in the area of polymeric bio-materials. Dr. Jayakrishnan received the Master’s degree in Chemistry from the University of Calicut in 1975, and followed it up with a Ph.D. from IIT Madras in 1980. He has been Visiting Scientist/Fellow at the University of Paris-Sud, Toyo University, Japan, University of Florida and the University of Liverpool in England. 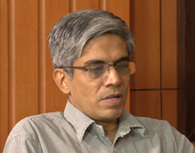 He is a Fellow of the Indian Academy of Sciences and the recipient of a number of awards, including the Materials Society of India Medal in 1997. Dr. Jayakrishnan is on the Editorial Board of the reputed international journal, ‘Biomaterials’. He has over 75 publications in international journals and nine patents to his credit. His postdoctoral work at the University of Florida led to the development of Ultraviolet Light Absorbing Intraocular Lenses which has been commercialized world-wide and millions of patients have been recipients of this implant. His pioneering work relating to the migration of plasticizer from flexible PVC based devices has been reported in the prestigious international journal ‘Nature’. Dr. Jayakrishan’s current research is focused on anti-bacterial polymer surfaces, surgical adhesives and in situ forming wound dressing materials, areas that have immediate relevance in health care. In recognition of his outstanding contributions to the field of fundamental and applied bio-medical research, IIT Madras and its alumni are proud to present him this award. Mrs. Meena Mutyala started her career with the Westinghouse Electric Company, USA, and is now the Vice-President of the Nuclear Fuel Engineering Division. She leads an organization of 450 employees in four locations in USA and Europe. In an illustrious career spanning over 27 years, she has held various technical and managerial positions in diverse functional areas of the company. Her meteoric rise in the world of business and technology, and her professional achievements have few parallels, and she is one of the very few women technologists from India to have reached these heights in a traditionally male dominated business. Meena Mutyala earned her Bachelor’s degree from Nagpur University in 1974, and followed it up with a Master’s in Physics from IIT Madras. She received another Master’s degree in Engineering Sciences from the Northwestern University in 1977. She received the MBA degree in 1990 from the University of Pittsburgh. She has struck a fine balance, and a not so easy one, between home and work. She is the proud mother of two brilliant children who are in college. Her concern for all who have interacted with her at home and at work, has made her a role model for many. In recognition of her outstanding professional accomplishments and managerial excellence, IIT Madras and its alumni are proud to confer on her this Award. Dr. Parimal R Desai is the Vice President, Chemical and Pharmaceutical Development at Wyeth Research, New York, USA. In an illustrious career, he has been the prime mover of several drug discovery and development initiatives in his company. He has provided technical and strategic leadership in successful development, registration and launch of several new pharmaceutical products, including well known anti-cancer drugs and therapies. He received the M.Sc. (Chemistry) degree from IIT Madras in 1983 and PhD in Biochemistry from Pennsylvania State University in 1987. In recognition of his technical and strategic leadership in the chemical and pharmaceutical industry he has been bestowed several prestigious awards, including the “Heroes of Chemistry” award of the American Chemical Society in 2004 and the “Exceptional Achievement Award” of Wyeth in 1999. Dr. Desai has championed the cause of mutlicultural teams and workforce through the organization of a company wide diversity forum. He is a member of the Research and Development Diversity Council, implementing diversity strategies with other R&D executives. In recognition of his significant contributions to the field of biochemistry and pharmaceuticals, and his technical and strategic leadership, IIT Madras and its alumni are proud to present him this award. Mr. Krishna “Kittu” Kolluri is a General Partner focusing on information technology investments at New Enterprise Associates (NEA), USA. NEA is a leading venture capital firm that is focused on helping entrepreneurs create and build major new technology based enterprises. He also serves on the boards of Ring Three Technologies, Port Authority Technologies, SnapTell, and Determina. Mr. Kolluri has a distinguished career of more than 18 years at the leading edge of the technology industry, in various technical and managerial positions. He started his career taking on engineering and management roles in the early days of Silicon Graphics. He then co-founded Healtheon to introduce healthcare online. Healtheon merged with WebMD in November 1999, in a deal valued at around USD 5.5 billion. He was the Senior Vice-President and General Manager in-charge of Provider Services at Healtheon/WebMD. He then took over as President and CEO of Neoteris in 2001, where he directed the creation of the Instant Virtual Extranet Technology market category, raised venture funding and built a stellar executive team. Neoteris was acquired by Netscreen and subsequently by Juniper Networks, USA. He served as the Executive Vice-President and General Manager of the Security Products Group at Juniper Networks. Mr. Kolluri graduated with a B.Tech. degree in Mechanical Engineering from IIT Madras in 1986. He received an MS degree in Operational Research from State University of New York at Buffalo in 1988. In recognition of his outstanding professional accomplishments and entrepreneurial excellence, IIT Madras and its alumni are proud to present him this award. Dr. Kris Venkat is currently the Chairman and Chief Executive Officer of Sundari Enterprises Inc., USA. He is the Chairman of the Board of several companies in USA, Germany and India, and a member of the Board of many others. He is an experienced entrepreneur, manager and teacher. Dr. Kris Venkat graduated with a B.Tech. degree in Chemical Engineering from IIT Madras in 1968 and followed it up with a Ph.D. from Rutgers University, USA. He has more than one hundred scientific publications and several patents to his credit. He has served on the editorial boards of many technical journals. He is the recipient of numerous awards, including Acharya Jagadish Chandra Bose award. In his illustrious career, Dr. Kris Venkat has held various senior management positions with multinational corporations including Merck & Co. and H.J. Heinz Company, USA, as well as start-up entrepreneurial organizations. As Chairman and Chief Executive Officer of Phyton, Inc., (USA) and it’s subsidiary Phyton GmbH (Germany), he was instrumental in building up a successful bio-technology company, whose formulations include the leading anti-cancer drug Taxol. Dr. Kris Venkat is a Visiting Professor of Biochemical Engineering at Rutgers University and has also held visiting faculty positions at Yale University, Dartmouth College, University College, Galway, Ireland, IIT Delhi and Anna University. He has served as an advisor on Biotechnology to the Government of India as well as a number of other Governmental institutions. He also serves as the Senior Investment Advisor to Techno Venture Management, Munich, one of Europe’s largest biotechnology venture capital funds. In recognition of his managerial excellence and significant contributions to the fields of Biochemical Engineering and Biotechnology, IIT Madras and its alumni are proud to present him this award. .